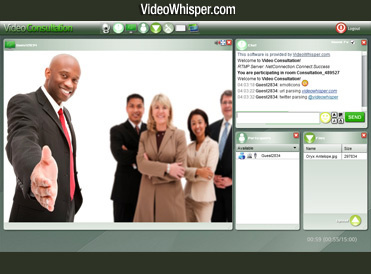 Instant 100% web based video communications for your business. WELCOME TO THE NEXT LEVEL! 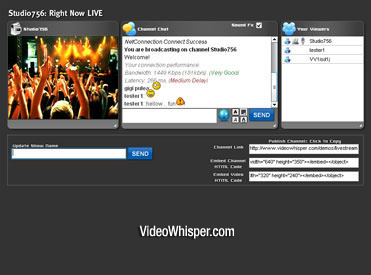 VideoWhisper provides multiple applications for various scenarios and interaction logic. No downloads or software installations are required for end users. Clients can access application with a click to room url. Applications support h264 video codec, acoustic echo cancellation. Allow unlimited users online by enabling P2P video streaming. Both direct 1 to 1 and group P2P streaming are supported. Change skins, icons, interface sounds, integration to various types of sites, multiple settings and permissions. Download software and run in free mode for trial, development, limited use. Some ads and limitations apply in free mode. Integrate with custom scripts or start from popular editions like Plain PHP, Joomla, WordPress, Drupal, Elgg, Moodle.